While the modern world continues to discover it as a superb health food, quinoa has an ancient heritage, dating back all the way in history to the time of the Incas and before. 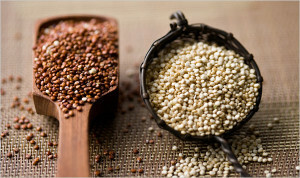 Quinoa is a wonderfully complete protein seed, with all the essential amino acids present. High in fiber, remarkably nutrient rich, gluten free and cholesterol free, it is now popular enough to be almost mainstream. Dal is a soupy or gravy preparation from pulses, a tasty protein dish of the Indian subcontinent. Traditionally a staple meal in India is dal had in combination with rice or wheat. Our delectable recipe here combines quinoa with a tasty Indian dal to make for a wholesome, nutritious meal. Made Indian style with a dash of spices (garam masala, turmeric), lemon juice, cucumber and dill leaves, you have a high energy, healthy and delicious modern staple dish of quinoa with dal. A great post-workout meal. Comfort food, reminiscent of India, but with an Incan heritage all the same.